I'm calling this a WIP, although it's 99% finished, really just finalising some music. 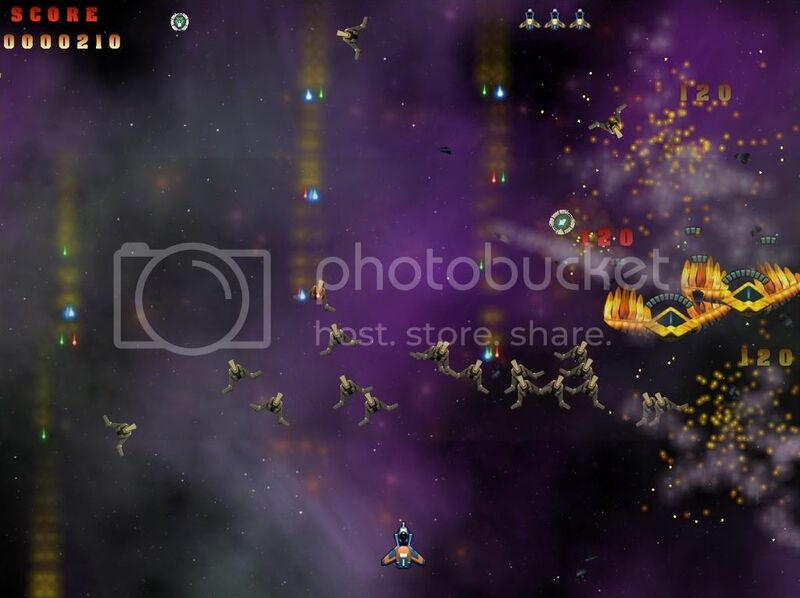 Firebird is an older game of ours, based on the space invasion, alien shooters of the 1980's. We've revisisted it this week, upgraded the visuals and audio effects, improved the front end and updated the pickups. We're hoping for a public release in about 3 weeks. We'll get a video together early next week, once our musical director finally agrees to a soundtrack he's happy with . For now, enjoy a screenshot of the alien menence being blasted into space. Looks awesome! Hope it plays the same! I'll pick it up on Steam when its ready. The ships are great, but why dont you use an additive mode for particles ? Quote: "Looks awesome! Hope it plays the same! I'll pick it up on Steam when its ready." We think so, as I say, we will get a video together this week and hopefully all will become clear. 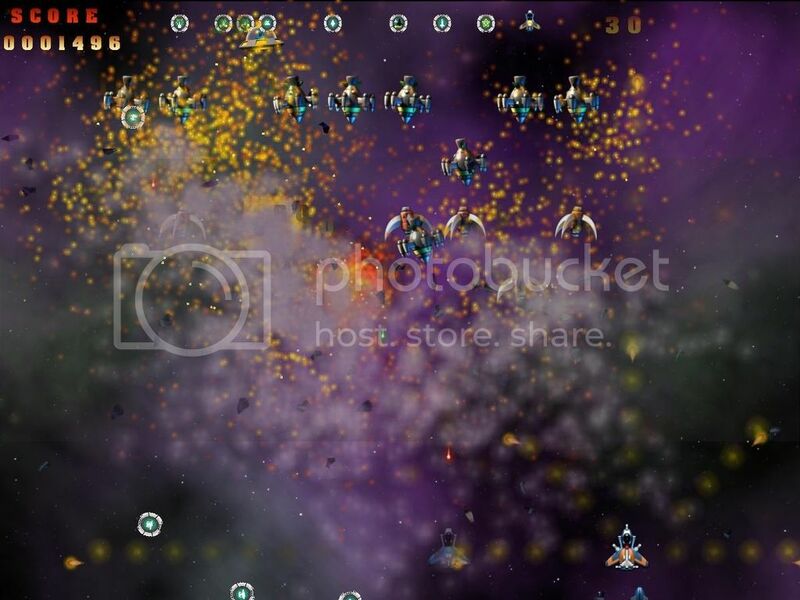 Quote: "The ships are great, but why dont you use an additive mode for particles ? Your fx would be better I think "
Nice idea, I'll be tweaking the particles this week as I'm still not 100% happy with them. Thanks for the feedback. Looks very nice, Scene! Congrats! Quote: "Looks very nice, Scene! Congrats!" Here's another update, this time, the much promised gameplay video! Enjoy. But not sure about the explosions? Maybe a nice animated sprite explosion with the particles? And the larger enemies maybe could flash or something to indicate that they are hit? Quote: "But not sure about the explosions? Maybe a nice animated sprite explosion with the particles?" Good idea about the flashing. I think the particles from bullets and explosions need to fade away faster. The screen look very busy very quickly. We've a few more tweaks to make on Firebird following some very useful feedback (thanks all), but in the meantime, we've been approved for release by Steam and have now started the countdown to release. If you know anyone who loves retro, please spread the word! We're pleased to annouce that Firebird - Steam version releases today and is available at a 15% discount for the next few days. It seems the link is not working, SC. Can you check? Btw, congrats by publishing your game on Steam! Quote: "It seems the link is not working, SC. Can you check? Btw, congrats by publishing your game on Steam!" Thanks for congrats and hopefully the link is fixed..
We all like free stuff, so if you fancy a chance to win a free copy of Firebird, we've teamed up with IndieDB to give you a change to do just that. SC and the JimJams Games team. I'll try to grab it again tonight. For some reason Steam website has been agonizingly slow for me the past many weeks. Not sure if anyone else is seeing this? But truly every page takes a long time to load especially the game pages I try to check out. Literally I have waited 10 minutes on some of them and still the thumbnail images have not all loaded in. I was pretty much thinking that will be the end of me buying games on Steam. But I will try it again tonight. I may need to point to different DNS servers. I think maybe the ones I am using are throttling down on Steam for some reason. Not sure because I have also read they have been hit with DDOS attacks in the past so maybe that is it BUT I don't think it is either because on my cell phone the site loads super fast using the same Internet connection. It is just weird. Maybe I will try killing the Steam Client and see if that is interfering with the website somehow. It seems to be the content delivery network they are using. Because I notice on every page in the lower left corner I see transferring data from steamcdn-a.etc etc and so forth and I see that message for about 10 minutes as a page loads. I found an option inside Firefox "Digital Rights Management (DRM) Content -> Play DRM-controlled content" that was enabled by default. I thought perhaps this was causing each and every image and video to be validated or something. I have no idea. But I unchecked it and it definitely made everything much faster loading. So I just grabbed it. I will check it out this weekend. Excellent, I hope you enjoy it. Funnily enough, I'm having issues with the Steamworks backend. It's very, very slow to update sales figures, so I'm wondering if there's a larger issue. i would just try a different browser, i used to use firefox for everything but in the last few updates it got super slow so i've swapped over to chrome and have to say it's so much more responsive i won't be going back to firefox. Can I ask anyone who has bought Firebird on Steam to please post a review, they really help with exposure.